Nettles have been used both as a food and as medicine for centuries. They’re said to stimulate the digestion and purify the blood. Our ubiquitous stinging friends are rich in vitamins A and C as well as trace minerals: iron, potassium, manganese and calcium. The young nettles emerge in spring and this is the best time to gather and eat them. They taste a bit like spinach, but nicer. Nettle soup is the easiest and most common way to consume this stinging weed. Don’t worry, it won’t bring you out in a rash. When nettles are cooked, they lose their sting. At this time of year, I use them as a general spinach substitute and add them to all sorts of dishes, including stir fries, quiches and curries. I know nettles are not to everyone’s taste, but I suspect not many would turn down a bowl of this soup, especially if they didn’t know what it was made of. My mother has surprised visitors on many an occasion over the years by revealing what the soup was after they’d consumed and enjoyed it. For most purposes, it’s best to take only the nettle tips when foraging as these are the tenderest. Older nettles and leaves can be tough. I tend to take the top 4-6 leaves. Unless you’re happy to grasp the nettle firmly and pick them with your bare hands in CT fashion, it’s best to where rubber gloves or snip them into a basket with a pair of scissors. The soup is quick and easy to make. Fry up an onion, a leek, garlic and a potato, then add the nettles and water. Simmer for 15 minutes or so, then blitz with a blender. I used my Optimum G2.3 platinum series induction blender which turns out a particularly smooth soup. Whatever you use though, you should find the nettle soup has a lovely velvety mouth feel. I make this soup dairy free as I like to think of it as a spring tonic, but you could always use butter instead of oil and add a drizzle of crème fraîche at the end to make it a bit more special. It’s hard to see from the photos, but I gave a bit more pizzaz to this nettle soup by drizzling a little wild garlic oil over it when serving. Wild garlic oil is fantastic and I’ve been using it a lot since I spotted a recipe for it at Food to Glow a few weeks ago. A delicious velvety smooth soup that will keep everyone guessing as to the mystery ingredient. In a large saucepan, fry the onion, leeks and garlic in the olive oil over a moderate heat for 5 minutes. Add the potatoes and fry for a further 5 minutes. Add the nettle tops, water and tamari. Bring to the boil, then reduce to a simmer for 15 minutes. Grate in a little nutmeg and grind in some black pepper, then blitz with a blender. Taste for seasoning and add a little more tamari if needed. Serve with a drizzle of wild garlic oil and some snipped chives if liked. You can use ½ to 1 tsp salt instead of tamari, but it won't have quite the same depth of flavour. I’m sending my nettle soup off to No Croutons Required at Tinned Tomatoes. Thanks for visiting Tin and Thyme. 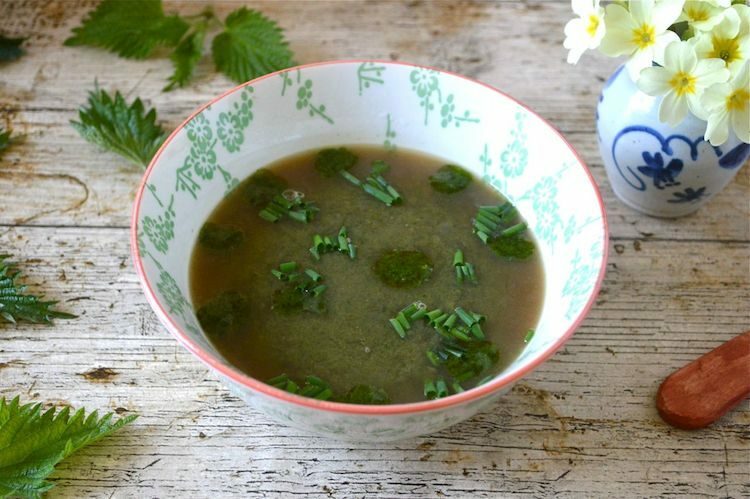 If you make this spring tonic nettle soup, I’d love to hear about it in the comments below or via social media. Do share photos on your preferred social media site and use the hashtag #tinandthyme, so I can spot them. For more delicious and nutritious recipes, follow me on Twitter, Facebook, Instagram or Pinterest. I use my Optimum Blenders for smoothies, spreads, sauces and even chocolate making. The post contains affiliate links. If you buy through a link, it won’t cost you any more, but I’ll get a small commission. Thank you for supporting the brands and organisations that help to keep Tin and Thyme blithe and blogging. Opinions are, as always, my own. OMG Jonny picks nettles with his bare hands too – what are these men made of??! What a great looking nettle soup! And excellent tips for foraging for nettles. Definitely best to don some rubber gloves! Thanks Kate. Where would we be without rubber gloves? I’ve only made nettle soup once and enjoyed it but it was a bit of work to deal with the nettles – I got them from a friend but have not had a ready source since – you seem to have a great plot with all your produce – I like your tradition of spring cleaning with the nettles, so to speak! Yes spring cleaning with nettles is exactly it. Our plot is decidedly ramshackle these days. We rather lost heart when the deer started to pay regular visits. Nettles is about all it’s fit for these days. Wow I’ve never tried nettle I am interested in finding out more of its benefits! Definitely worth trying if you can, nettles are meant to have loads of benefits. This looks amazing. I’ve never actually made nettle soup although I have used nettles as a spinach substitute in a quiche and they were delicious. I should really get out this coming weekend before the nettles become to big and not so tasty. Nettle soup is one of my favourites. Mind you I say that about most soups 😉 Do get those nettles whilst they’re young and tender. Yay for nettles. I’m a big fan. My NZ travels were so long ago now, I can’t remember if we saw nettles or not. I’d be surprised if they’re weren’t any though. Great recipe choclette. I love nettle soup but have never been brave enough to forage for it myself! One day I’ll find nettles over here 😛 I never have any luck! Oh no! You could always buy some nettle tea and drink that instead. Haha, townie indeed. CT who grew up just a few streets away from you is the greatest forager ever! This looks amazing! I really want to give this a go as its something Ive never made. Always a bit too unsure on what to do with nettles I think. I had no idea that cooking removes the sting. We have loads in our garden every year and I always chop them down and throw them away!! Time for a change I think! Do you put the stems into the soup as well or just the leaves? Hi Debbie. 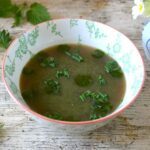 Nettle soup is delicious and a good way to use up some of your garden nettles. It’s best to use the young tips of the nettles only – the top 4-6 leaves. The stems and old leaves are generally too fibrous.